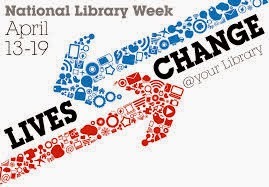 This week is National Library Week (April 13-19, 2013) so we were thinking about why we love our library. We'll give you our top ten and an invitation to tell us your library love stories. Our librarians know us by name and they are the best in the WORLD. Two words: Interlibrary Loan. Book from Ohio, no problem, oh and no charge. During flu season, I've watched as they carefully wipe down books and stand them on their spines in a row to dry, so lovely, like little inspiration soldiers all ready to get back to the field. The entire catalog is online so we can browse and hold books anytime of the day, the Mom is known to do her best browsing late night. Feel free to share any library love stories or tell us about your favorite library in the Comments below. This is an updated reprint from the BFWP Vault. Every morning --that I actually worked-- I entered library and ahhh, the smell of books --it was better than coffee. Across from our office was the private collection of archived and special books, oh how I loved that room, all those old books behind glass --I dare not admit all the time I stood, just looking, through that glass. I reported to Sylvia Wedberg, who arrived every morning, with perfectly coiffed hair, snappy suit and expertly applied lipstick and with amazing punctuality and vitality. She was probably 45 years my senior and arrived to work in a sporty Datsun 240z, I drove an old blue Chevette. One day Sylvia called me to her desk. "Your idea for re-arranging the best-seller list is great, so is the new list of titles on the computer and the new idea for files, pretty good." Then she leaned in, "Amy you have great initiative, but you need to work on your finish-iative." That stung. I was young and I was brilliant, I understood computers and I knew all the answers. But that woman, she knew the truth: I did not possess an ounce of finish-iative, back then. Thanks to Sylvia and Margaret I learned a lot in college. I learned to be organized, I learned to love books and I learned that I was not meant to learn in a classroom. The buzzing fluorescent lights, the artificial temperatures and worst, schedules, not meant for me. The library and all those librarians, books and microfiche were altogether romantic to me. But, I was 19 and I was wool gathering, my time for the library was to be in my future. I quit that job and cannot remember what replaced it --but will always remember my job at the University of Detroit Mercy Library. The second memory is of the sunnily-lit, windows-aplenty spot I would perch myself within during day's off while living in South Haven. In-between knowing what I wanted to do when I grew up, post-college, these days of refuge in the library involved scheming voyages westward--maps traversed and tiny towns inhabited. I selected dreamy addresses, the city-names-of-which were Libby and Kalispell and Half Moon. Every week I would give myself a new 'assignment' for bouts of creative writing so that I did not 'lose' what I had so intuitively 'found/gained' during my contemplative years studying in a liberal arts setting. Walking into the doorway of that library with my notebook in hand, I was making myself accountable to imagining a 'different' life--a future I could dream of, attain, and be proud of. Two library love stories come to my mind. Years ago, when my dad was ill and too feeble to go to the library, I would go for him. We had a little joke about how many books I would bring back that he had ALREADY read! Boy did we laugh, as my dad, the baseball fan, would say to me, “Looks like you’re only batting 33 1/3 today.” It was with a great sense of pride and a BIG smile on my dad’s face, when I batted a 1000! More recently, one of my daughters, age 3 at the time, went to her first library story hour in Detroit. She loved the local library and was so excited about being there for the program. When we arrived, a little group was forming and sitting on the floor. Gleefully, she promptly sat down; took off her shoes & socks; and was all ready for the story! Forever, she has been very comfortable and loving around books. I remember dearly a huge library, the biggest I had seen until then. There was a dark time in my life when I had a terrible experience and I had to go and live for a short while in a women's shelter. I was down, lost and had not much self-esteem, I was feeling so sad I had no desire to talk to anyone about anything, but I felt the need to do something with my time and with myself, so I decided to spend that time at the library, it was the perfect place to be left alone. Every day after breakfast I would walk to the Van Pelt library at UPenn and spent the whole day there, just until 7:30 pm, my curfew. I found there everything I needed to "hear", I read novels, self- help books, philosophy and just about anything that caught my attention, I loved to spend my time there, alone, in silence, in security, I was tiny and invisible among all those books, anything I could want to know was at the reach of my hands, available, immovable, the books gave me spiritual shelter and helped me to self heal. I think that was what helped me the most to get out of this hard time and made me feel like moving on, to get out of my shell and face the world again :). When I was eleven, my dad caught me stealing his fantasy books. There was probably no need to sneak them, now I see that he happily would have shared, having a firm belief (unlike many parents) that a book might confuse or discomfort me but never hurt me. But at the time, my eleven year old mind saw only that those books belonged to him and therefore to an adult world I was not a part of. So watching me, writhing in embarrasement and shame, he just shrugged and said, "Go get your shoes on." And he took me to the public library and put "The Riddle Master of Hed" by Patricia McKillip into my hands. (To this day, she is still my favorite author). I still remember the first lines in the dust jacket, "The people of Hed were farmers. Even the princes of Hed were farmers and Morgan was a prince of Hed." Reading those words, I felt. . . I felt like I had come home. Not just in the library but in that book, I had found something that resonated in my bones, something that comforted me and let me fly. Thanks Dad and Public Library and Mrs. McKillip wherever you are. That was one of the first moments I understood who I was.